Sometimes, the simplest answer is the correct one. Share counts are based on exact URLs, so if you change the URL of a page you will lose the existing share counts for that page. This includes changing a URL from HTTP protocol to https. However, there is a workaround for recovering share counts in that scenario. Social networks use the canonical tag and the open graph URL tag to determine which URL to share and display share counts for on a particular page. Shares on other social networks will not display for individual share counts, nor will they contribute to the share count total for the page. If you are sure that you have shares for a particular URL that are not being displayed, it’s possible that you have a share count minimum set that hasn’t been reached yet. In your AddThis dashboard, open the tool settings for your share buttons, then select the share counts tab. 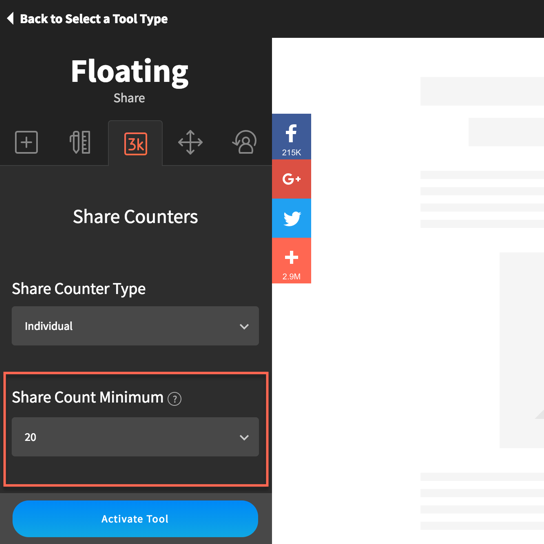 If you have a high value set under “share count minimum”, it’s possible that the shares for the page have not reached the minimum. If you still have questions about share counts, feel free to contact our dedicated support team. We are always glad to help!